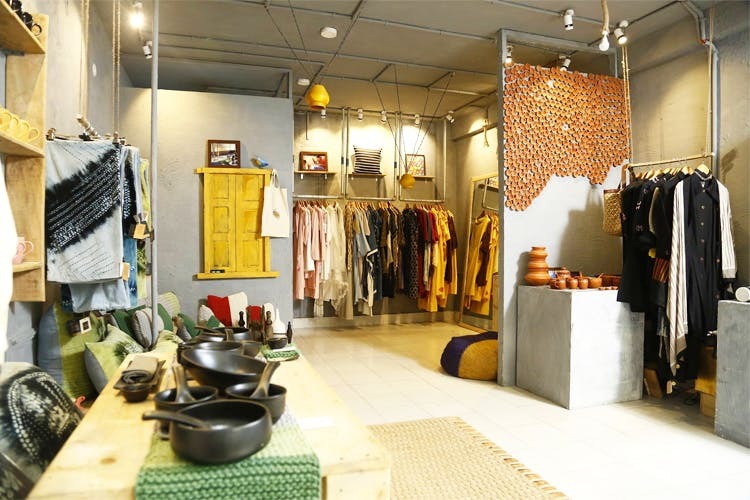 If you’re on the periphery of Dada Jungi Lane in Shahpur Jat, you’ll find a cute little shop called Peeli Dori, which houses fabulous home décor and clothes. Peeli Dori has a lot of handcrafted products made by women from rural India, who use raw cloth to sew gorgeous dresses, shirts, cushions etc. We love the fact that it’s so raw and transparent, and that the handcrafted finished product looks classy and elegant at the same time. Each label has a picture of the woman on it, describing her efforts in to making the clothes from scratch. Community development never looked better to us! Apart from clothes, we loved their hand-knitted cushions in pastels and teal. Rugged and luxurious at the same time, these cushions are again the handy work of rural women working through communities. When those shiny, velvety cushions don’t do justice to your couch, you can always try these out. They have a great website, but we wish they had a couple more on-ground stores.